If you are going darker, then start coloring at the roots. If you are going lighter, and you have a dark regrowth, you need to deal with the regrowth first and lift it. Once you have done so, inspect the hair carefully and always start applying your toner at the part where it needs the most lift. In general, you do need to be aware that the root area will always lift the fastest because of the heat coming from the scalp and because it is virgin hair. We used Brilliant Blonde and 20 Vol Developer at the root area to deal with a dark regrowth. After processing and rinsing the root area was actually lighter than the lengths. So when we applied Intense Pearl Blonde Toner 100V with 10 Vol, we applied first to the lengths, then to the root area. In this way we avoided a "hot root" and we got a great result. Case No.2: Extremely Dark Regrowth, Very Light Ends. Color Correction by Elona Taki. Here we had a huge, extremely dark regrowth. although the lengths were super white blonde. There could be banding issues unless we did it right. There could also be breakage issues because the ends were super light. We mixed Brilliant Blonde Lightener with 30 Vol. We made it fairly pasty, a little less developer than usual: 1 part lightener to 1.5 parts lightener. We wanted to deposit a lot of mixture and really saturate and lift this extremely dark regrowth. After rinsing we saw that the part that was the yellowest was 4 - 6 inches away from the root area. Then we applied color elsewhere. 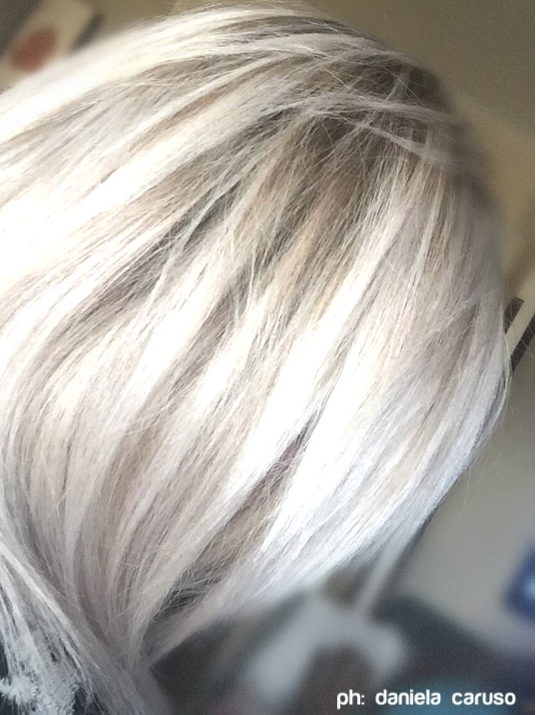 We toned with Silver Blonde toner (10B) and Pearl Blonde toner (10V), mixed 50/50. We used 10 Vol developer. What is the Difference Between Permanent and Demi-Permanent hair color? Permanent hair color and demi-permanent hair color both belong to the class of hair color known as oxidative dyes. These dyes work through a combination of pigments, a developer, (otherwise known as an oxidizer) and an alkali base. This alkali base is ammonia in the case of permanent hair color and is ethanolamine in the case of demi-permanent hair colors. The alkali’s function is to open up the hair cuticle. Ammonia is the more effective of the 2 in terms of opening up the hair cuticle but has a stronger smell. Ethanolamine opens up the cuticle a little less, but smells more pleasant. Both permanent and demi-permanent hair color work in essentially the same way. 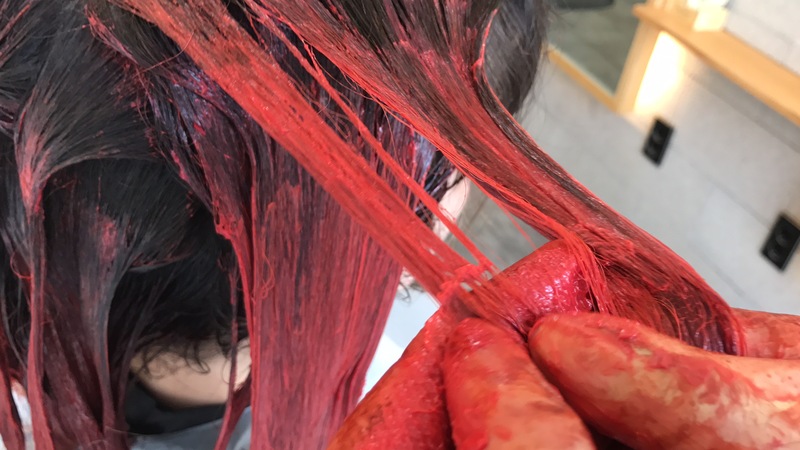 The hair cuticle opens up when it reacts to the alkali base, the hydrogen peroxide helps to lift out some of the natural pigments, and color molecules are then deposited in their place. When the hair is washed with an acidic shampoo, the cuticles re-close and the hair returns to its original form. Is Ugly Duckling Hair Color Permanent or Demi-Permanent? Permanent. But we do add some ethanolamine into some of our permanent color in order to improve the cosmeticity and improve the smell. Isn’t Demi-Permanent Supposed to be Better for the Hair than Permanent Hair Color? It is true that demi-permanent dyes open up the cuticle a little less than permanent dyes. However, the flip side is that demi-permanent colors tend to be less vibrant and may cover grey less well. Also, it is important to note that permanent dyes, when formulated the way that we formulate them at Ugly Duckling deliver Argan Oil and other essential conditioning agents right into the cortex during the coloring process. So, we color and condition at the same time. What Are the Advantages of Permanent Hair Color? Great range and choice of color. Ability to go much lighter. Ability to mix colors to produce creative and innovative effects. What Are the Advantages of Demi-Permanent Hair Color? Open the cuticle less, deposit color only. Gradual Fade-out only after 6-8 weeks. What About Semi-Permanent Dyes? How do They Work? Semi-permanent Dyes, otherwise known as Direct Dyes deposit pigments directly onto the surface of the hair. You do not need to mix these dyes with developer. They can produce vibrant color results, but they typically last less long on the hair as compared to permanent and demi-permanent hair dyes. Ugly Duckling's Rainbow Colors are Semi-Permanent Hair Colors. What About Hair Bleach? How Does it Work? Hair Bleach removes color from the hair through the process of oxidation. 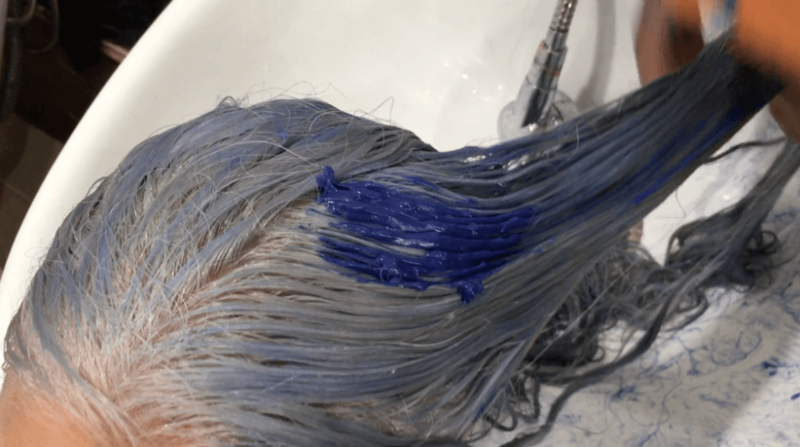 This processes basically removes all the color pigments from the hair, which is why bleach can turn your hair completely white if left in long enough. Can Hair Color Provoke an Allergic Reaction? According to studies, the vast majority (more than 98%) of women do not react to hair dyes. For some rare women, however, the PPD (or paraphenylenediamine) or its close cousin PTD (or paratoluenediamines) present in hair dyes may provoke an allergic reaction on the scalp. The exact cause of why some women have allergic reactions while most do not is still not known. However, it is observed that the development of these allergies typically happens after many colorings, sometimes after 10 or 20 years of successful coloring – it is as if the scalp suddenly “flips” from being non-sensitive to being sensitive. Ugly Duckling always recommends that you do a skin test first on your customer and wait 48 hours before doing a coloration. To learn more about Ugly Duckling's Hair Color Range, visit our product page. Why Does My Scalp Itch When I Get It Colored and What Can I do About it? The itching is primarily due to the developer, which contains hydrogen peroxide. This may cause the mix to feel itchy when applied. 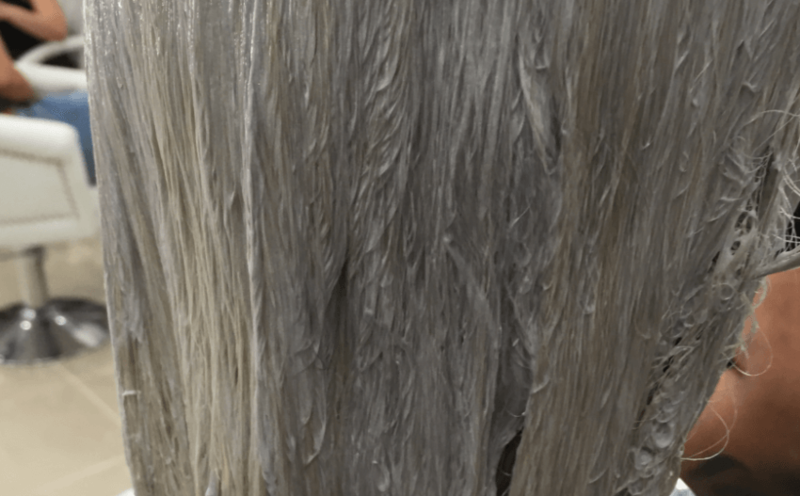 Ugly Duckling color contains added lanolin extract to place a protective layer over the scalp and provide for a more comfortable coloring experience - a silkier, more comfortable feeling on the scalp. This additive ie being progressively added to most of our colors to provide greater comfort during the coloring process. Looking To Take Dark Hair Ultra White Blonde? 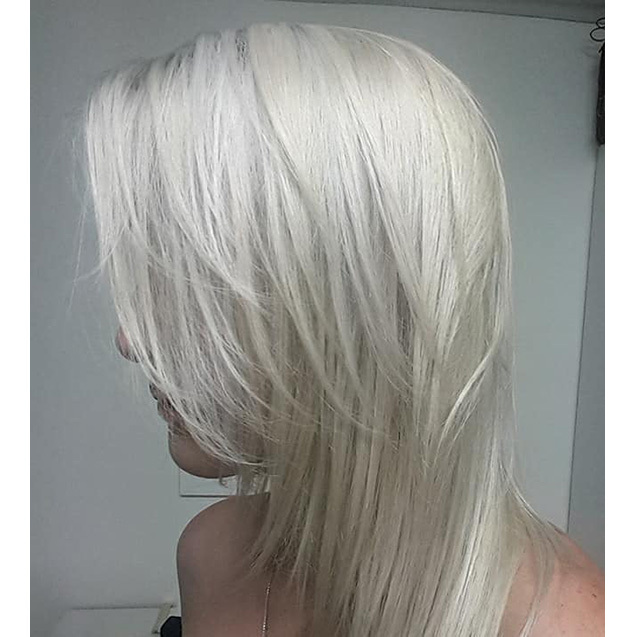 As a stylist, do you get requests from clients to bleach and lift dark hair to ultra white blonde? It is possible to do this and maintain hair integrity at the same time provided you do it right. Our model had very frizzy, long dark hair, and we succeeded in transforming her into an ultra white blonde look which she was very happy with and which she wore to her summer proms. We bleached and toned our model's dark hair to this! This was done in 1 sitting. In this tutorial we will show you how to achieve this in your own salon. Our recommended mix is 1 part Lightener to 2 parts Developer. This gives a mix which is fairly runny, which is what you need to saturate the hair properly and work fast. At the same time, it is not too runny that it will drip off he brush. As this model has fairly dark hair and we are looking to go ultra white blonde, we decided to start off on the lengths using 30 Vol Developer. The rule of thumb when using bleach is 20 Vol developer for 1-2 levels lift and for the root area, and 30 Vol for 3 levels lift and more. Section the hair and apply the mix thoroughly using a brush, starting from the back where the hair is the thickest. At this stage, apply only on the lengths and leave out the last inch closest to the root. Aim to deposit as much of the mix as possible. In this case, because of the hair frizziness, after applying with a brush, we re-applied with fingers using gloves. This is long hair, and bleach needs to be applied as fast as possible so that all the hair lifts equally. So first section the hair into 4 large quadrants, and pin back 3 quadrants. Start off with one of the quadrants at the back. Section this one into very fine sections and start applying the bleach. Work your way round the hair as quickly as you can. Once you have applied everywhere on the lengths, check how it is processing, especially at the back where you started. If the mixture has dried up and you have still not lifted to level 9/10. you will need to re-apply fresh mix. Check also for hair integrity. As long as the hair is still strong and has its natural elasticity, you're good. In the case of dark hair, virgin or healthy hair, after 30 minutes of processing you can rinse and re-apply one more time if you have not achieved level 9/10. 6. Now Apply On The Root Area, Using 20 Vol Developer. In general, you need to be careful when applying bleach on the root area. A skin sensitivity test is always recommended before any bleach application. Heat from the scalp means that hair near the root always processes faster than anywhere else. That is why for the root area, we made a fresh mix using 20 Vol Developer. Because the lengths are all done, we were able to concentrate on the root area, and rinse as soon as we got the desired result. After rinsing with water, apply Ugly Duckling Intense Pearl Blonde Toner with 20 Vol. Once again, work fast, starting off with the lengths. Return to the root area afterwards. You will see the pigments of the toner will start to change. This is normal. Let the color process. Do not let the toner process more than around 10 minutes on the root area and more than 20 minutes overall. 8. Rinse with Purple Shampoo and/or Mask. Now rinse with Brilliant Blonde Purple shampoo and/or Mask. These products contain intense violet pigments which will help finish your hair color result and kill any residual yellowness. Because they are low pH, they also help to close the hair cuticle after the lightening and coloring. Covering Grey Hair, especially when you want to get it White Blonde can be a Challenge! In this blog post, we go through the 8 key steps you need to get right when covering grey hair. Check your client's hair at the regrowth area because that is where you can see the grey hair the best. Decide how much percentage grey hair your client has. Also check the thickness and coarseness of the hair, because the coarser it is, the harder it is going to be to get good color penetration and good grey hair coverage. 2. Decide on the Product You are Going to Use and Whether any Prelightening is Required. If your client has 25% grey hair or less, you can go ahead and use the color your client has chosen, provided it is within 3 levels of your client's natural hair color. Mix with 20 Vol developer, and apply. People sometimes want to use 10 Vol developer for grey hair coverage, but we don't recommend that. The reason is that you need the color molecules to penetrate really well for good grey hair coverage, and 20 Vol developer is better for that. If you want to lighten by more than 3 levels and then cover, you will have to pre-lighten using our lightener Brilliant Blonde or alternatively use one of our high lift colors. The recommended mix for grey hair coverage is 1 part color to 1 part developer. In general, you will need to apply some base color in along with your target color in order to get good grey hair coverage. If your customer has more than 25% grey hair, and in particular if it is thick and coarse and dark, we recommend you add in some of the base shade into your mix. When you do this, always stay at the same level as your target hair color. If your client is looking to get a 7.1, mix in some of the 7N. And if your client is looking to go ultra white blonde, you would need to add in 10N along with her pearl blonde or silver blonde toner. If your customer has 25% grey hair, mix in 25% of base with 75% of the desired hair color. If your customer has 50% grey hair, mix in 50% of base with 50% of the desired hair color. If your customer has 75% grey hair, mix in 75% of base with 25% of the desired hair color. If your customer has 100% grey hair, you will need to use only the base color. Please note the above are indications only, you should vary this rule once you work out what is best for your client's hair. Some grey hair is just easier to cover than others. Also, the more blonde the hair is, the more you should consider blending away the grey with toned blonde hair rather than masking the grey hair. 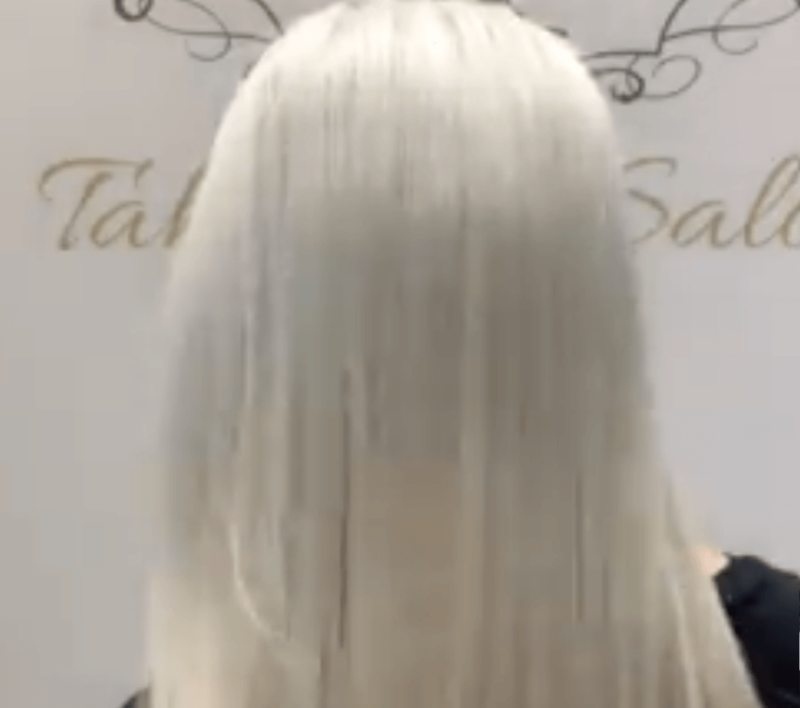 If for your client has under 20% grey hair, you can sometimes get away with just blending away her grey with blonde toner as shown in the video below. 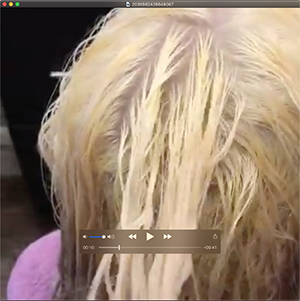 Video of Blending Away Grey Hair on Blonde with Pearl Blonde Toner. Hair by Elona Taki. 5. Use the Extra Coverage Colors if the Hair is Really Coarse or Resistant to Grey Hair Coverage. If your customer has very resistant grey hair, we would recommend that you use the Ugly Duckling Extra Coverage Series ("NN") instead of the base shades. Generally speaking grey hair coverage on thick dark hair (eg Latino, Asian, Indian hair) can be difficult to cover. We recommend using the Extra Coverage Series in such cases. These colors can be mixed in with fashion color according to the ratios given above. They can also be used on their own. They give really excellent grey hair coverage. We have just launched 8NN and 9NN in addition to 6NN, 5NN, 4NN, 3NN and 1NN. 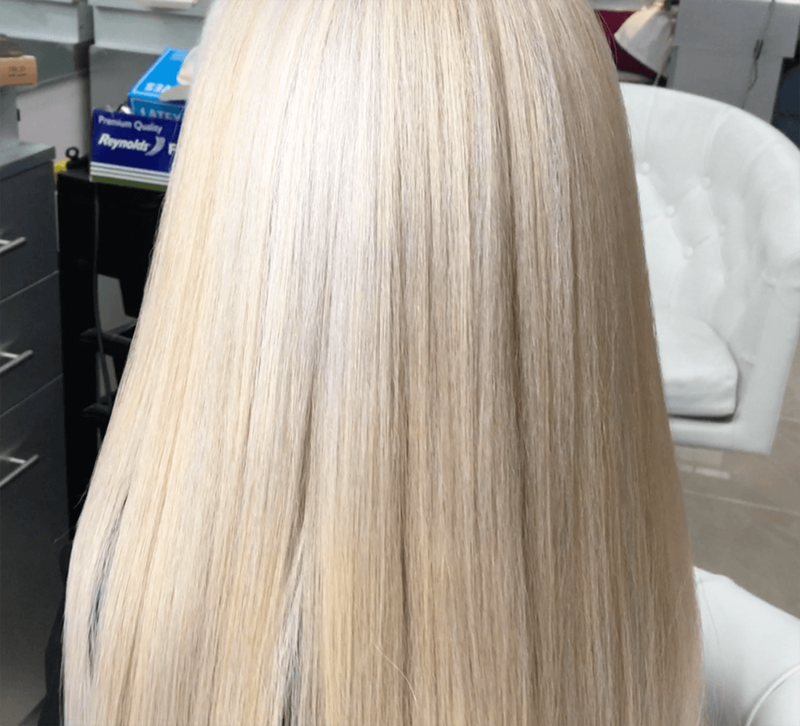 If your client is totally white at the roots and she is looking to go ultra white blonde all over, mix in some base 10N along with your chosen toner (pearl blonde, silver blonde etc) and 20 Vol developer. If she has dark or salt and pepper hair and she is looking to go ultra white blonde, prelighten really really well to get rid of all the dark otherwise it will show. Then use the toner along with the 10N as above. 7. Follow the Basic Rules of Color Application. Section the hair in the usual way into large sections. Pin up all the sections. Let one section down: in general it is best to let a section at the back down, this is typically where hair is the thickest and takes the longest to cover. Make small segments and start applying. As you finish one segment you can pin it back up and attack the next section. Try and work fast to give the whole head a relatively even processing time. As usual, make sure you get really good product saturation on the hair. To get really good color vibrancy, make a second applications, rubbing in product with fingers using gloves. To be extra sure of getting really good grey hair coverage, you can extend the development time by 10 minutes. So, process 40 minutes instead of 30 minutes. Then emulsify well. The process of emulsification, which means "rubbing the hair with a few drops of water", helps lock in the color. After emulsification, rinse in water and finish off with an acidic shampoo to close in the hair cuticles. The Final Result - Ugly Duckling Ruby Red & 30 Vol on dark hair. 8. Extra Tips for Truly Stubborn, Stubborn White Hair! Sometimes grey hair or white hair can be very very stubborn. Hair at the temples, in particular, can be very resistant. Unfortunately this is also where it is the most visible. In this case, you can do something which the French call "mordancage". Apply pure 20 Vol developer on to the parts where it is stubborn & where the color does not take. Apply the developer on dry hair. Apply in sections, in the usual way. Then re-dry the hair using a blow dryer (don't rinse). This process will open the cuticles of the hair and make the future coloration process easier. Once the hair is dry, apply your chosen color or mix in the usual way. Begin applying first on the areas which are difficult to color. This will give those parts more processing time. In general, "mordancage" should not compromise hair color or vibrancy. On the contrary, it should help get you better color results and better vibrancy. What is color cleansing and how do I do it? Color Cleansing generally refers to the very mildest form of color removal. It involves the use of bleach with shampoo. In order to do color cleansing, mix equal parts of bleach, 10 Vol Developer and shampoo and warm water. Massage in at the back bar and leave it to process 20 – 30 minutes, then rinse. Color cleaning is a relatively light process and can be done to remove some color build-up or for tone correction. It can be used for removing small amounts of color and for tone correction (going from warm to cold). What is color stripping and how do I do it? Color stripping is the term used for a stronger color removal processes. This is required to remove a significant color build up. Here one typically uses Bleach + 30 Vol developer and one normally leaves it on for 20 minutes or longer. What is color correction and how do I do it? 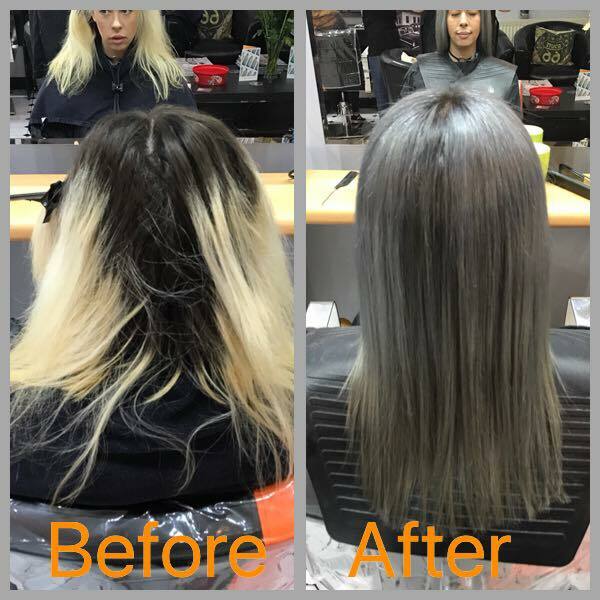 We generally use the phrase "color correction" to refer to cases when one part of the hair, very often the regrowth, is a totally different color to the rest of the hair. 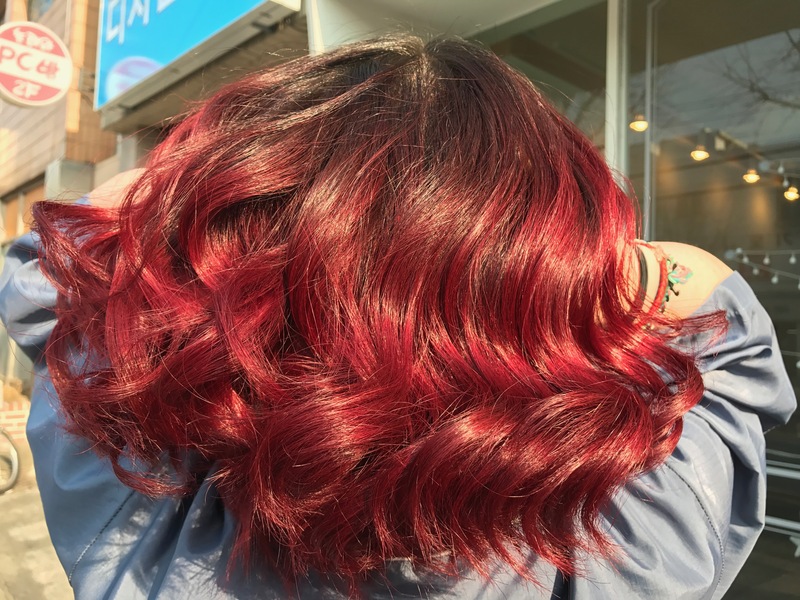 Customers expect the stylist to lift up dark areas and equalize the whole head to produce one totally consistent color result with no visible line of demarcation. Assess how many different areas you are dealing with and what levels they are. Use Brilliant Blonde lightener with the appropriate choice of developer and apply to the darker sections and lift them up. Very often you will have to deal with cases as shown in the picture above...a very dark regrowth, and ends which have already been prelightened. In such cases, pay particular attention to the scalp area as well as the overlap area with the lengths. At the scalp area, the heat will cause the bleach to process extra fast. So do the color correction on the regrowth but stay away from the last inch nearest the scalp, and return to the scalp at the last. The overlap area with the lengths can also be a difficult area to deal with. You need to blend it in to avoid a visible line of demarcation. But at the same time you must avoid breakage. This can happen if you overload bleach mixture onto pre-lightened hair. 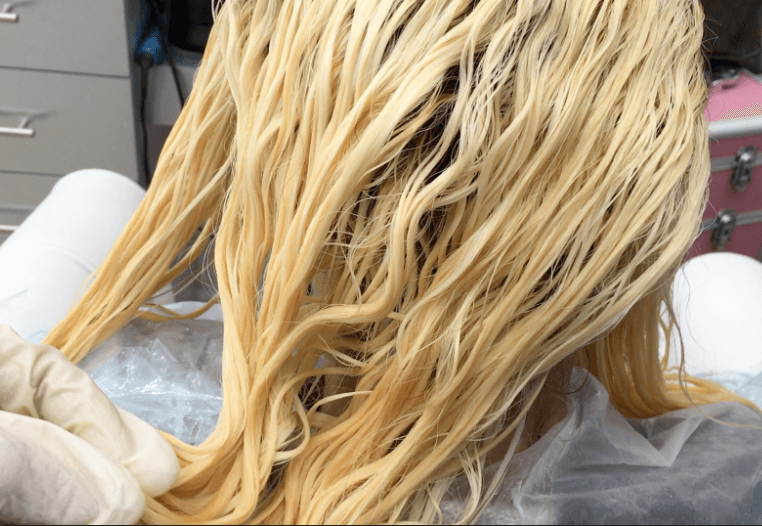 If by chance too much mixture has been applied onto a white prelightened strand at the overlap area, use the bleach processing time correctly: take a towel and wipe off. Keep checking the hair as it lifts to make sure that the hair is lifting correctly and you are getting the hair to where it needs to be. What do I do after I have lifted and equalized? After you have got the whole head up to a consistent color, you are ready to start coloring or toning. Apply the usual rules of color application. How about if I have used some very bold colors. Can I use bleach to color strip this? Yes, you can. For more severe build-up, you will need to use a stronger mixture. In this case, use bleach +with 30 Vol and develop for 15-20 minutes. If you still have not removed the build up after 25 minutes, wash off and repeat. I have color build up on my mid lengths but my regrowth is virgin hair. What should I do? In order to get a uniform color result, there are no shortcuts. Your entire head must be at the same level before you start coloring. So you need to take care of your build up first with a color stripping operation specifically on the part with the build up. 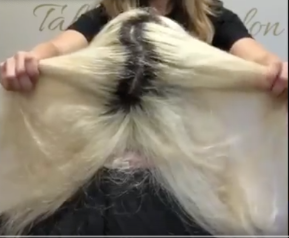 In order to avoid visible lines of demarcation, it is recommended to brush through the bleach mix right through the rest of the hair in the final 10 minutes. Then start the color process on the full head. What Products Should I Use for Color Stripping, Color Cleansing and Color Correction? We do recommend Brilliant Blonde for color correction, as it has been developed for dark bases and can lift up to 8 levels safely and effectively. It is available both in tub and in sachet form. For more information on color lifting and cleansing, please visit our Brilliant Blonde page. For toning, use intensive pearl blonde or intensive silver blonde toner for first time toning applications or if the hair is still a little yellow. For repeat toning applications, use no-lift pearl blonde toner or no-lift silver blonde toner. You can use a regular color also according to the result desired. In the picture above, metallic grey was used with 20 Vol. Oh My - What a Regrowth! Our model waited a little too long to come in. So we have a huge, extremely dark regrowth. although her lengths are super white blonde. This is going to be a little tricky, because there could be banding issues unless we do it right. In this tutorial Elona Taki is going to show us how to bleach and tone. We mix Brilliant Blonde Lightener with 30 Vol. Make it fairly pasty, so a little less developer than usual, say 1 part lightener to 1.5 parts lightener. In this case as we want to deposit a lot of mixture and really saturate and lift this extremely dark regrowth. Start working on the back. With bleach you really need to work fast to give all the hair an equal processing time. So some hair stylists may decide to start off with 20 Vol on the back, and then move on to a fresh mix with 30 Vol on the top, as this area is going to get less processing time by the time you get around to the top. Alternatively, stay with the same mix, but move really really fast. Stay just a little (1/8 inch) away from the scalp, the mixture will travel up. The scalp creates heat, and this can lead to overprocessing on the root area, leading to banding issues. At the same time you need to be careful in this case not too overlap over the lengths as they are really really white. Place a lot of product on the hair with the brush. Hold it firmly and press because you do need to really saturate the product. 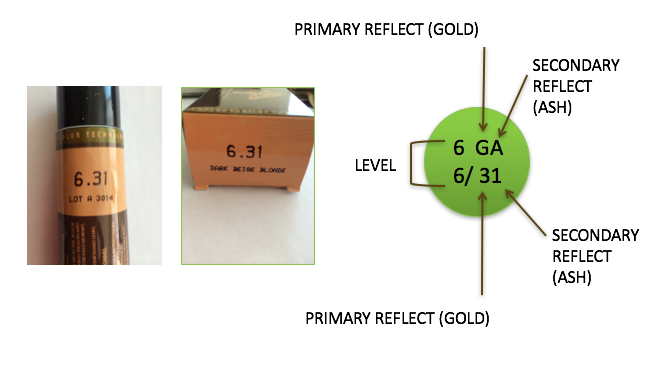 Work section by section and re-saturate. Take down piece by piece and go over it one more time. Don't just leave your client and walk away, with bleach you need to check, check, check!. 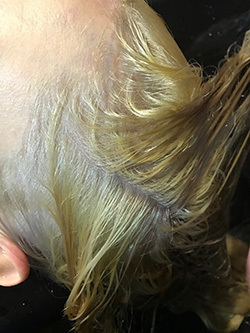 If you have overlapped with the lengths, now is your chance to take a towel and rinse off on those parts to avoid banding (bleaching onto already white hair will make it very very white) and even to avoid breakage. In this case, we took around 20 minutes of processing. Make sure you get it all the way up to a true pale yellow. Don't wash off too soon! You can rinse off a piece from the back to check. We are going to tone with Silver Blonde toner (10B) and Pearl Blonde toner (10V), mixed 50/50. We are going to use 10 Vol developer. We can apply these toners straight away on wet hair. You can even apply at the back wash if you prefer. After rinsing you can see that the heat of the scalp got the hair really blonde near the scalp, but lower down it is a little more yellow. So we are going to have to adjust with our toner application, and be sure to really apply and re-apply on the yellow parts. 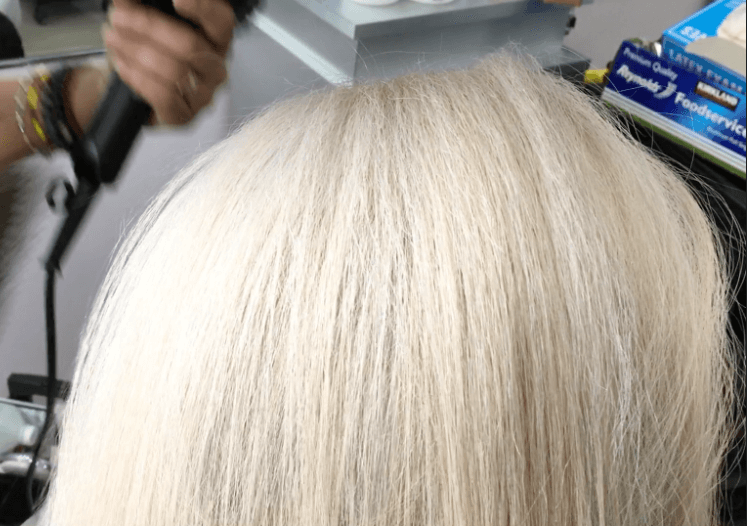 Our aim is to get the whole head right up to a beautiful white blonde hair color result. We section and apply, starting from the back. Remember to work really fast - this is important! Wait about 10 minutes and rinse. Wash and blow dry and you're done! They are also low pH (acidic), which means they are great to use straight after coloring or bleaching, as they will help close the hair cuticles and keep them healthy. They are Gluten and Sulfate Free. (1) What Do Purple Shampoo and Mask do exactly? Purple Shampoo and Mask contain intense purple pigments which act to kill the yellowness in blonde hair and make blonde hair more white. (2) How do They Work? Purple is the exact opposite of yellow on the color wheel (remember your art classes when you were young?) They cancel each other out. (3) So What Kind of Hair Can I Use These Products On? Any hair as long as the color is blonde. It doesn't matter whether the hair is naturally blonde or lightened blonde. (4) I've got dark brown hair. Will Purple Shampoo and Mask Work? Ummm, no, sorry! Purple shampoo and mask tone and correct blonde hair really really well, but they won't lift dark hair. (5) How Long Do The Results Last? It depends on the hair quality, but a couple of weeks at least and sometimes more. (6) How Often Should I Use These Products? Ugly Duckling Purple Shampoo and Mask are sulfate free professional hair care products. So you can use them as often as you like. We generally recommend a weekly use of the shampoo and the mask to maintain your blonde look. (7) How Do I use The Purple Shampoo? Apply to Wet Hair and Massage Very Thoroughly - at least 5 minutes. Make sure every part of the hair has been thoroughly saturated with shampoo. Leave on for another 5 minutes and then rinse thoroughly. (8) How Do I Use the Purple Mask? Apply using a dye brush or fingers. Apply on lengths and ends first, not roots. Rub in really really well. Leave on for around 10 minutes, ideally under a plastic cap and using some gentle indirect heat (how towel or steamer). This allows the purple pigments to penetrate the hair cuticle. (9) Can I use these products in the salon straight after lightening or coloring? Absolutely! That is what they have been designed for. They are low pH products, so they do help to close the hair cuticle after the coloring process. Some of the purple products out there in the market are not low pH, and cannot be used in this way. (10) Anything Else I need to Know About These Products? They also have a really nice perfume! WATCH THIS VIDEO TUTORIAL ON USING PURPLE SHAMPOO AND MASK NOW! I ABSOLUTELY LOVE this product line! I ordered the Ugly Duckling Brilliant Blonde highlighting powder, Pearl Blonde Toner 10.20, the Brilliant Blonde Shampoo and also the Brilliant Blonde purple masque! My hair has never looked and felt so soft! I would highly recommend! I read some of the reviews before using it and I have to say I messaged back and forth with the company and they answered ALL of my questions and concerns. I will definitely be ordering more! What does Ugly Duckling Hair Color consist of? Cream developer, which comes in a 33 oz bottle. When you mix the 2 ingredients together and apply it on the hair, you open the hair cuticle, take out the melanin (the hair’s natural coloring) from the cortex and you add in composite color molecules. We also add in Argan Oil. 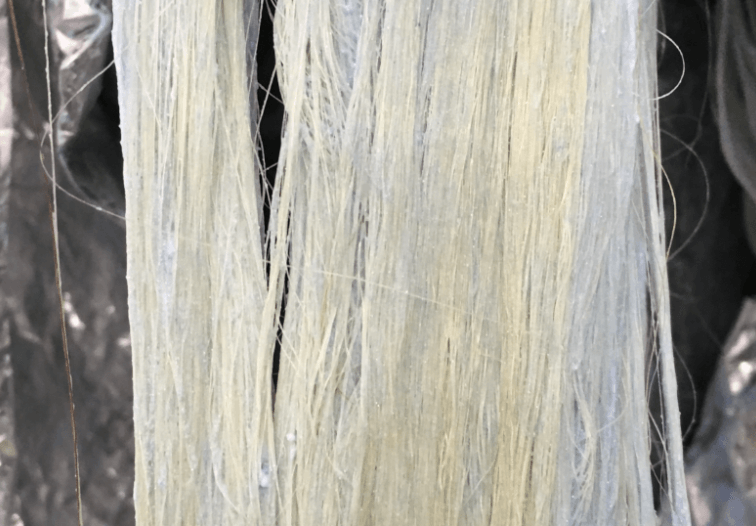 We are also progressively adding in lanolin extract to all our permanent dyes to provide for a more comfortable, "silkier", coloring experience on the scalp. How much ammonia actually exists in Ugly Duckling’s low ammonia formulations? All Ugly Duckling color formulations are low ammonia formulations, whether they are dark or light. To give an example, Ugly Duckling hair colors on level 1-2 have ammonia concentrations of 1-2% only. For the Ugly Duckling high lift colors, the ammonia concentration is a little higher, but even so the ammonia concentration is only around 3%. In other words, very very low. On shades level 6 and lower, we are in the process of partially replacing ammonia with Ethanolamine. Once again, this is in order to offer the consumer the lowest ammonia concentration. Is it true that Ugly Duckling hair colors are more vibrant than most? Yes, it is true. When developing the Ugly Duckling color range, we put in specific pigments to ensure greater vibrancy and long-lastingness. 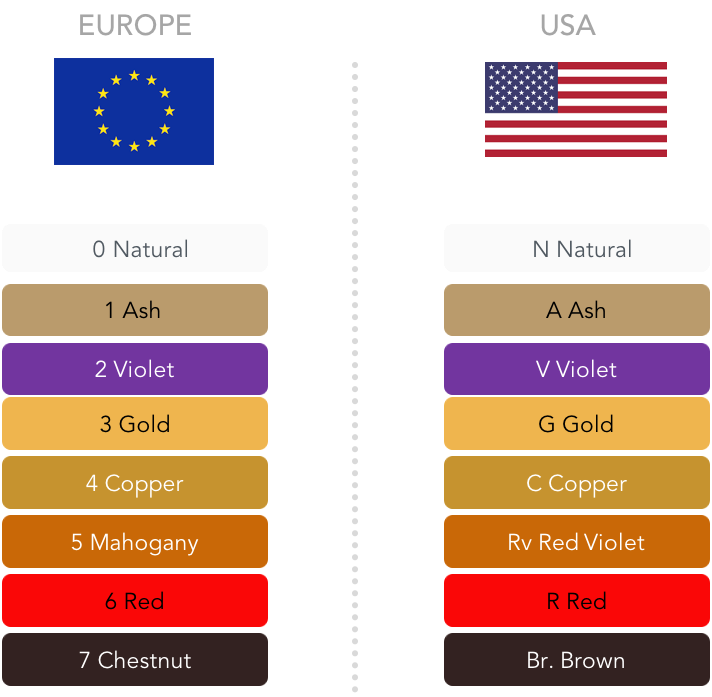 We also developed specific statistical testing methods to test color vibrancy and we benchmarked our colors shade versus shade against not just American, but also European and Japanese competition. And not just on Caucasian, but also Asian and African American hair. Our hair color technology is called Tru-Color Technology. This technology is your guarantee of accurate and precise coloring results every time. We know how important this is for a hairdresser. We test our hair colors continuously against competition and we do sometimes tweak our hair colors to improve their performance. We are the only company that does this on an on-going basis. For example, we are currently in the process of reinforcing our coppers to produce a more vibrant color. So if you feel that there is a color or coverage deficit on any of our colors, we would be most happy to hear from you. Please supply us with details, especially the shade of the competitor which performs better and we will check it out, test it and reformulate it. Is it true that Ugly Duckling Hair Color is paraben-free? Yes, it is true. 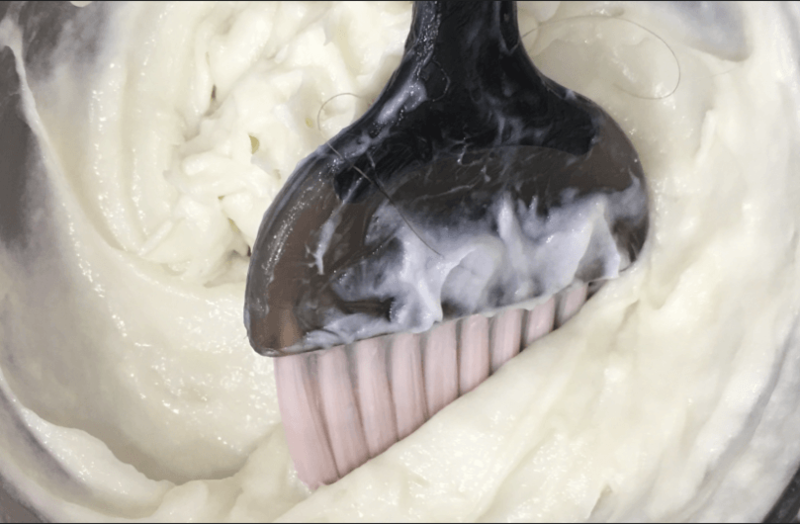 The vast majority of professional hair colorants from major brands contain parabens. Ours do not. Ugly Duckling does not conduct animal testing either during product formulation or in the process of commercializing its products anywhere in the world. It is important to realize that any foreign company selling in China today, is obliged to do animal testing in order for these products to be certified by the authorities. It sounds crazy, but it's true. This basically means that any foreign company which is selling in China (and this includes many well-known hair brands) is causing its products to be tested on animals. Once again. Ugly Duckling does not test on animals, in China or elsewhere. Ugly Duckling Rainbow Color is a new type of direct color which conditions and colors at the same time. It contains Argan Oil, Aloe Vera and Hydrolised Keratin to add condition and shine. Rainbow Color does not contain any PPD and does not require any developer to use. Just prelighten hair and apply. Rainbow Color lasts up to 30 washes. It fades "true" - it does not deviate from its original color. Apply Rainbow Color onto hair using a brush. If you are applying several colors, be sure to use separate bowls and brushes, and try and keep the different colored sections of hair apart during processing time. Rinse using cold or tepid water - no shampoo. The hair will gradually fade over time. You can keep the hair color longer by washing with cold water. Incredibly long lasting colors - Really worth it ! Customer Review. Should I Color Roots First or Last? Permanent, demi-permanent hair, semi-permanent color - What's the difference? 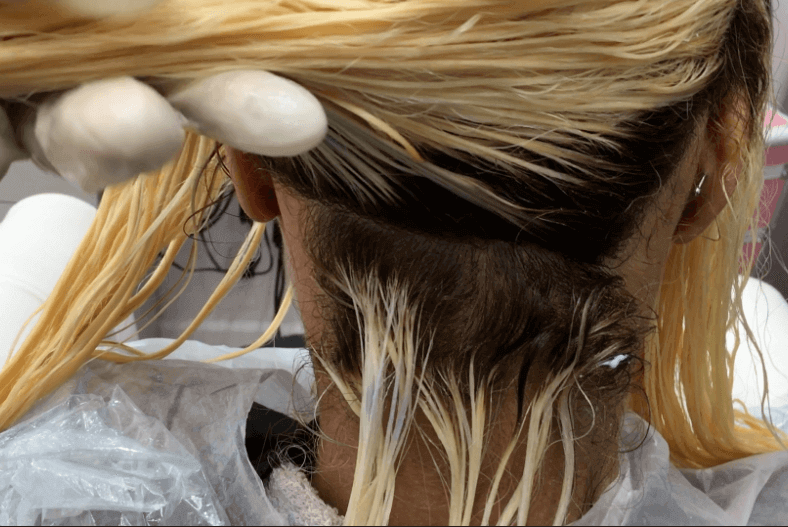 How to Bleach and Tone Hair When You Have a Dark Regrowth. How Does Ugly Duckling Color Work?